The key to our triple digit data efficiency rates is that we solve the IO problem. By reducing IOPS and eliminating duplicate writes before they ever hit the disk, we save on capacity and improve performance. Our revolutionary technology enables VM-centric global management of all VMs, data, and the underlying infrastructure, making our solutions the most efficient for the modern, agile datacenter. 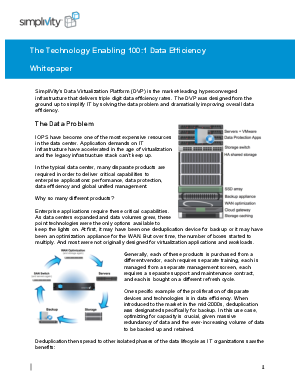 Download the whitepaper "The Technology Behind 100:1 Data Efficiency" to learn more.